When it comes to this time of year, many Jews feel torn between Christmas and Chanukah. Whether it is from feeling as though we must compete with our non-Jewish friends or wondering how to navigate a family that celebrates both holidays—it can get kind of tricky. One thing to keep in mind during the holiday season is that Chanukah and Christmas are different holidays. As much as Chanukah may be confused for being the “Jewish Christmas,” it is not; therefore we shouldn’t try and make it such. Instead, embrace the differences. Appreciate that each holiday celebrates and focuses on something different. Chanukah may not have the ubiquitous decorations that Christmas has come to have, but that doesn’t mean it has to fall short. Find the parts of Chanukah that are meaningful to you, and focus on that. If you are working to navigate an interfaith family, it can sometimes be tough to decide which traditions to keep or how to explain these to your children. Something that may sound relatively basic but it can be really helpful is to try and identify what this holiday means to you and why it is special. Maybe it’s the spirit of the holiday, having time to spend with your family, or the overall peacefulness that comes along with it. Whatever the holiday means to you, let that guide how you speak with your children about it. Find out what exactly is important to you in the holiday and focus on that. One thing that can be hard during this time is wanting your children to have the same experiences you did when it comes to the holidays. When it comes to interfaith families, however, that may not happen; instead you have the opportunity to form new traditions around your holidays and how you choose to celebrate them. So, if you want Chanukah to be a holiday focused on light and oil while leaving the presents for Christmas—go for it! Or maybe you want to somehow link the holidays, by all means! When you focus on separate things within each holiday, creating unique and special traditions for each, you take out any feeling of competition or inferiority and create two holidays that may be separate but are equally special. 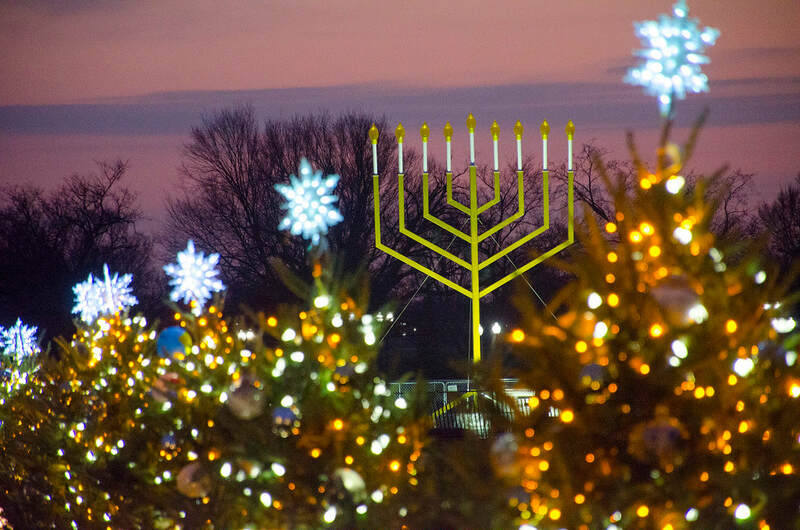 It can be challenging to navigate trying to balance Christmas and Chanukah, but it may be comforting to realize that there are a lot of other families working to figure out the same thing. This also means that there are a number of resources out there that may make it a bit easier. These include a number of children's books that focus on both Chanukah and Christmas, such as Nonna’s Hanukkah Surprise by Karen Fisman, Eight Candles and a Tree by Simone Bloom Nathan, and December’s Gift: An Interfaith Holiday Story by Ashley Smith- Santos. [MD1] There are also a number of books for adults, including Introducing My Faith and My Community: The Jewish Outreach Institute Guide for a Christian in a Jewish Interfaith Relationship by Rabbi Kerry Olitzky and Twenty Things for Grandparents of Interfaith Grandchildren to Do (And Not Do) to Nurture Jewish Identity in Their Grandchildren by Kerry Olitzky and Paul Golin.